Now, you can put your money where your mouth is and show everyone your school spirit with new fashion apparel and accessories. 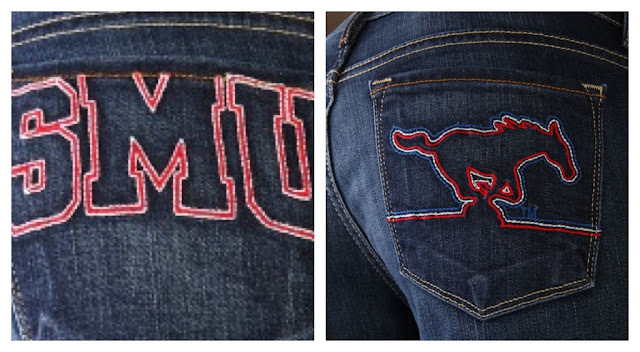 First up, are jeans from OCJ Apparel (Original College Jeans) showcasing custom collegiate designs for 6 major universities including SMU and TCU. OCJ has created a line of denim that is stylish and comfortable enough to wear anytime, no matter what you’re doing. Show your school pride and sense of fashion whether you’re on campus, at the game, or going out for the evening. OCJ’s are perfect for all occasions. Each University sports 6 different design options at around $127 each. Available in skinny or boot-cut. Available at Flirt Boutique, 2633 McKinney Avenue, Suite 150 (214-754-7001); The Blues Jean Bar, 6810 Snider Plaza (214-368-5326), $118-$135. To see styles, go to www.ocjapparel.com. Kick up your heels in custom cowboy boots and represent your school in true Texas style by stepping out in these stunning SMU Pony cowboy boots by Bonafide Boots in a bold mix of school colors: blazing red, vintage cream and royal blue star accents. Your beloved Pony team logo prominently displayed on the side of each boot for all fans to adore! TCU Fans can flaunt their devotion to your program by sporting these Horned Frog cowboy boots in a game-stopping mix of school colors: purple crackle, purple and gray star accents. 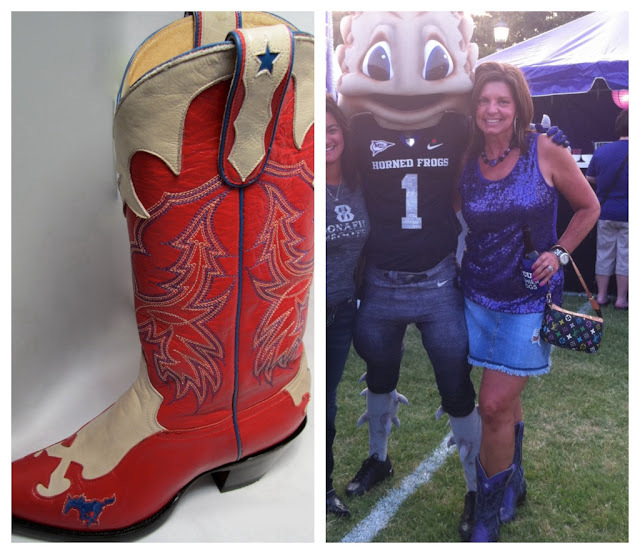 Fear the Frog with the team logo prominently representing Horned Frog spirit on the side of each boot! Available online for $489.